The Pivot of Civilization was published in 1922. It contains Margaret Sanger’s belief that civilization rises or falls on how it views the ‘people problem.’ It wasn’t simply the fact that there were too many people. The kind of people roaming the planet were also a problem. What kind of people? Sanger says it explicitly: feeble-minded, defective, moronic, epileptic people. What should be done with them? They should be put into camps. They should be sterilized. They should be segregated. Does this sound familiar? 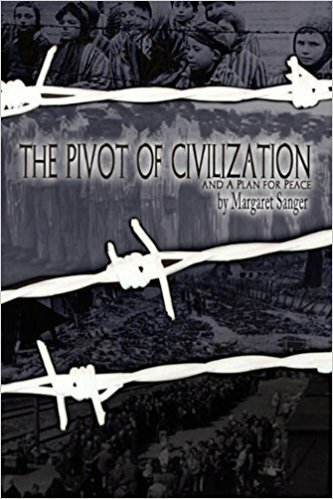 It is but one small step to add: “They should be exterminated.” 10 years later, Sanger introduced her ‘Plan for Peace’ (included in this book) which made similar calls. So it was that some of the most devilish ideas carried out by the Nazis not more than a decade later were just as popular in America. Indeed, it appears the Nazis may have gotten their ideas from American eugenicists! Sanger’s book will give you a new perspective on the intellectual climate in the early 1900s and a new understanding of contemporary events and issues.